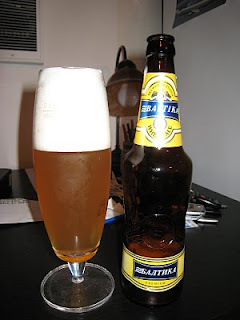 Baltika started brewing right around the end of the Soviet Union and the communism really comes through on the bottling. If you didn't notice, this is the Baltika #8. They have 10 beers, numbered 0 to 9. There are three unnumbered beers, Baltika Kuler, Light and Kuler Lime. Number zero is non alcoholic, so I don't think I will be doing that one. The wheat is a surprising little brew. It's got quite a bit of head, and doesn't settle for a few minutes. It seems to be unfiltered, but I could be mistaken. The color is a perfect amber and the taste is very simple, most likely an average of all wheat beers on Earth. It's not as sweet as some other wheat beers, and only has a subtle hoppiness. Pretty average, although a good price point for a beer from eastern europe.